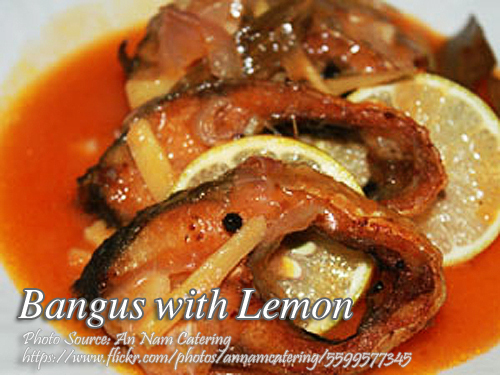 This is a unique bangus dish because it uses lemon instead of vinegar or calamansi as a souring agent. This dish is similar to sweet and sour fish because it also contains a little bit of sugar. You can increase the amount of sugar according to your preference. To cook bangus with lemon; Coat the bangus with salt and fry until golden brown. Set aside. In another pan, saute garlic, onion and ginger. Then add lemon juice, laurel, brown sugar and pepper. Simmer for a few minutes and add a little water if the sauce is drying up. Then add the fried bangus and coat with the sauce very well. Coat the bangus with salt and fry until golden brown. Set aside. In another pan, saute garlic, onion and ginger. Then add lemon juice, laurel, brown sugar and pepper. Simmer for a few minutes and add a little water if the sauce is drying up. Then add the fried bangus and coat with the sauce very well. Serve hot. The recipe is yummy. I have a problem though. I live in Australia and bangus is not easy to get. Do you know a substitute fish I can use instead of bangus? Thank you. I think tilapia can be a good substitute.